The humble swede has always been an under estimated vegetable. But in recent years it has been going through a mini revival. Good storage qualities and improved breeding has made swede more grower friendly. Crop acreage has increased by some 30% and more seed varieties are becoming available to the home gardener. F1 Swede 'Tweed' is the first F1 Swede variety. It has been bred for its uniform, globe shaped roots and vigorous growth. Its fondness for less fertile soil and resistance to club root make it a perfect variety for successful growing at home. This superb variety has good storing qualities and is ideal for a late autumn harvest. Very appealing with purple shoulders and a delicate flesh, mashed in butter or used in stews, the lovely creamy flesh makes it a great choice for Sunday lunch. Swedes, also known as Rutabaga is a cross between cabbage and turnip (the name is an abbreviation of ‘Swedish turnip’), the flesh is more yellow and the flavour both milder and sweeter. There are other differences – the plants are hardier, the yields are greater and the growing period is longer. Swede is one of the easiest vegetables to grow and well-suited to the novice gardener. All you have to do is sprinkle some seeds in late spring or early summer, thin a few weeks later and then lift the large, globular roots as you need them from autumn until spring. This frost-tolerant, hardy plant thrives in moist soil. It crops over a long period of time and can be left in the ground through winter. Few other crops are quite so straightforward. Swedes are brassicas and like other members of the family need a firm, non-acid soil which has reasonable drainage. Pick a sunny spot and dig in autumn. Like most brassicas they do not like an acid soil so add lime to the soil if necessary. In spring apply Growmore fertilizer and sprinkle Bromophos if cabbage root fly is known to be a problem. Prepare the seed bed a week later, treading down and raking the surface. Dig rows 1cm (½ in) deep and sow seed very thinly then cover with soil. Rows should be 37cm (15in) apart. Thin out the crop as soon as the seedlings are large enough to handle. Do this in stages until the plants are 9in (23cm) apart. Keep the soil hoed and remember to water in dry weather – failure to do so will result in smaller and woodier roots. Rain following a dry spell can cause roots to split. Begin lifting as soon as the roots are large enough to use there is no need to wait until they reach their maximum size, use when they upwards of 'billiard ball' size. Harvest is usually from early autumn - November to February, but can extend from mid September to the end of March. Do not hesitate to smell the roots, the stronger the scent, the stronger is the flavour of the vegetable. You can leave them in the soil and lift with a fork as required until spring, but it may be more convenient to lift and store them indoors in December for later use. The storage technique is to twist off the leaves and place the roots between layers of dry peat or sand in a stout box. They will store in a cool shed or refrigerator for several months. Blanched rutabaga can be frozen for up to a month. Because of its fresh sweet taste, swede is great for eating raw in salads and coleslaw. They are particularly good when teamed with other root vegetables in soups, stews and casseroles. You can also harvest the leafy "tops" and treat as cabbage. In Scotland, rutabagas and potatoes are boiled and mashed separately to produce "tatties and neeps" ("tatties" being the Scots word for potatoes), traditionally served with the Scottish national dish of haggis as the main course of a Burns supper. Neeps may also be mashed with potatoes to make clapshot. Regional variations include the addition of onions to clapshot in Orkney. Neeps are also extensively used in soups and stews. In Yorkshire and Lincolnshire, swedes are often mashed together with carrots as part of the traditional Sunday roast. Planting brassicas, of any kinds, in the same ground more often than once every four years runs the risk of club root infestation and once you have it, the ground is useless for up to a decade. Don't take needless chances, even with "catch crops" of radishes. "Rutabaga" (from dialectal Swedish "rotabagge", root ram) is the common American English term for the plant, while "swede" (Swede) is the preferred term used in much of England, Wales, Australia and New Zealand. In the U.S., the plant is also known as "Swedish turnip" or "yellow turnip", while in Ireland and Atlantic Canada, where turnips are relatively unknown, it is called turnip. In Scots, it is either "tumshie" or "neep", and the turnip (Brassica rapa var. rapa) instead is called a "white turnip". Scots will refer to both types by the generic term "neep" (a contraction of the archaic pronunciation "turneep"). Some will also refer to both types as just "turnip". Scottish people refer to only large roots as turnips. 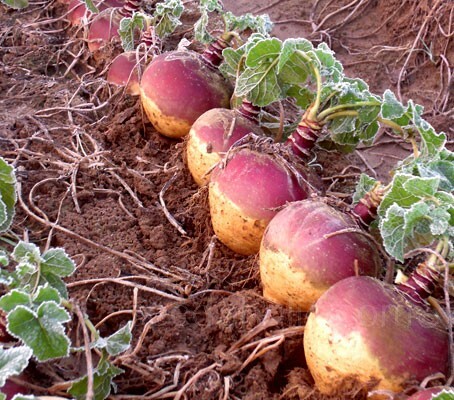 In North-East England, turnips and swedes/rutabagas are colloquially called "snadgies". They should not be confused with the large beet known as a mangelwurzel! Some claim the vegetable is native to Sweden, but others think it was introduced to Sweden, possibly from Finland or Siberia, in the early 17th century. It was an important nutritional source for many Finno-Ugric tribes before the introduction of potatoes. From Sweden, it reached Scotland, and from there it spread to the rest of Great Britain and to North America. Prior to pumpkins being readily available in the UK and Ireland, swedes/rutabagas were hollowed out and carved with faces to make lanterns for Halloween. Often called "jack o'lanterns", or "tumshie lanterns" in Scotland, they were the ancient symbol of a damned soul. During World War II swedes were often used as filler in "mixed fruit" jams in Britain. In continental Europe, it acquired a bad reputation during World War I, when it became a food of last resort. In the German Steckrübenwinter (rutabaga winter) of 1916–17, large parts of the population were kept alive on a diet consisting of rutabagas and little else, after grain and potato crop failures had combined with wartime effects. After the war, most people were so tired of rutabagas that they came to be considered "famine food," and they have retained this reputation to the present day. As a consequence, they are rarely planted in Germany. Rows should be 37cm (15in) apart.